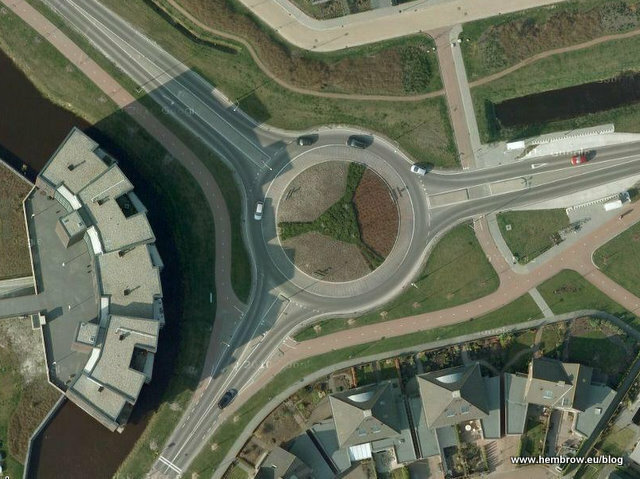 A view from the cycle path: Every Roundabout in Assen. 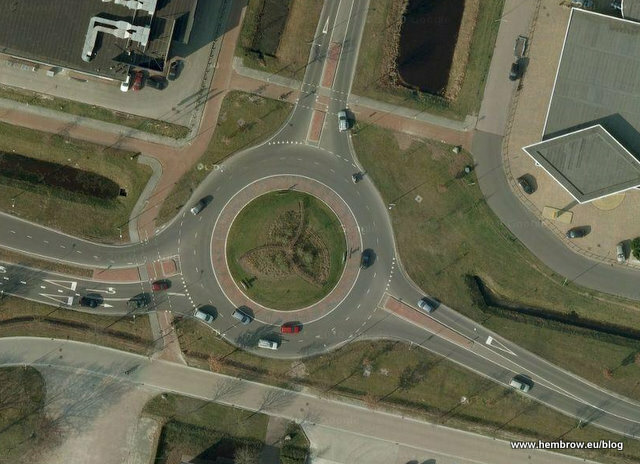 Variations of the safest roundabout design. Now that's a lot of roundabouts, people in Aus. always complain about Canberra being the roundabout city. 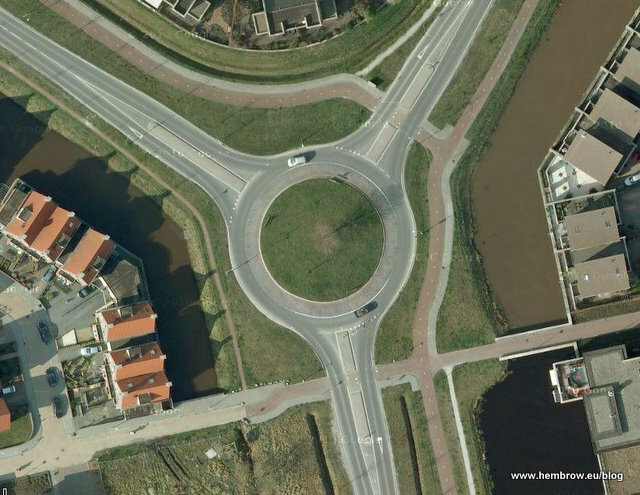 Yet compared to the Netherlands it would be the norm in road planning. Looks superb for suburbs and rural areas. 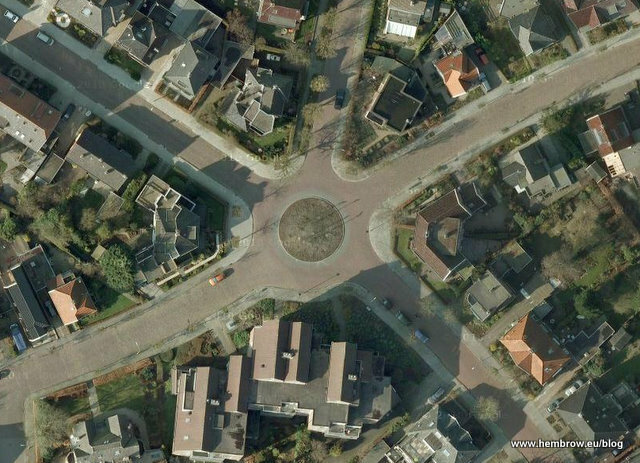 Can you do a focus on Dutch urban crossroads, also from the top? Isn't the car park on the right of the second photo part of a bus station, or at least a place where all buses pass and allow for changes? The small "roundabout" on the last photo is the only way to connect five streets in an orderly manner. It's a lot smaller than it looks on Streetview, and has so little traffic that people often cut corners (I know, I live in the cul-de-sac in the top right corner). The birds are ravens; the original greenery were shrubs and trees which blocked the view so were removed. What about pedestrians? 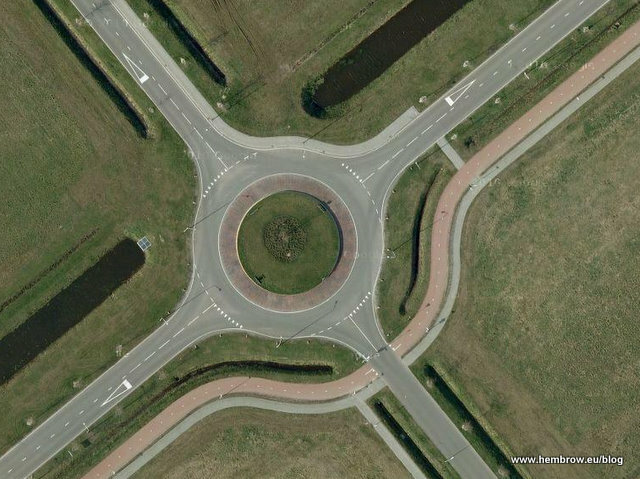 I notice that some of the roundabouts only have cycle paths, no sidewalks. Do pedestrians walk on the cycle path? It's the opposite here in the Greater Toronto Area. Sidewalks are everywhere, but cycle paths are rare. Reaperexpress: Good point. I've updated some of the descriptions. In general, anywhere where you might find an appreciable number of pedestrians you'll also find separate pedestrian paths. The cycle-paths in the town usually have pedestrian paths next to them. However, where there are rarely pedestrians, such as outside the city boundary, there are no specific paths for pedestrians and the few people who walk here use the cycle-path. They're rare enough that this doesn't cause a problem for either group. 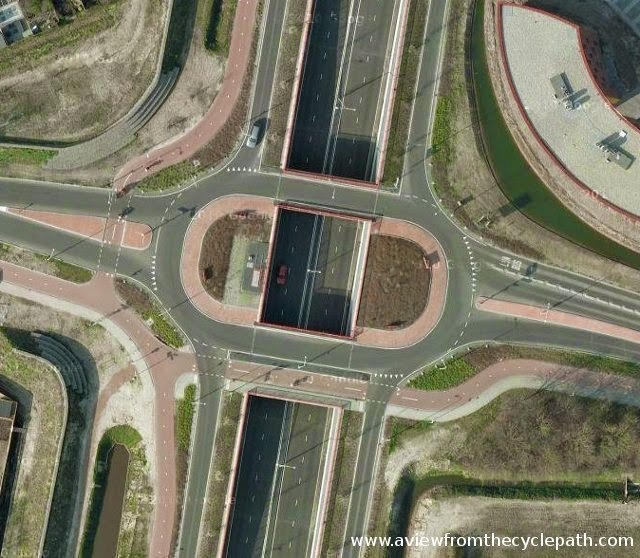 Shared use paths intended for use of large numbers of both pedestrians and cyclists are not built in the Netherlands. 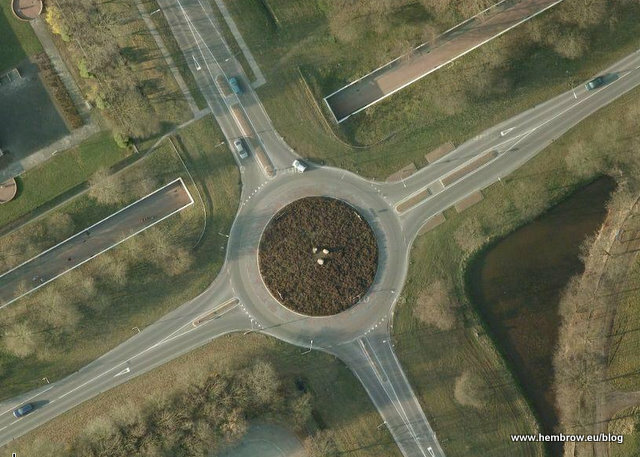 Frits: Yes, the second photo is that roundabout, at the very top of the city. I really ought to write something about the Dutch concept of a "transferium", where people can swap modes between bike / car / bus. We call them park 'n' rides. 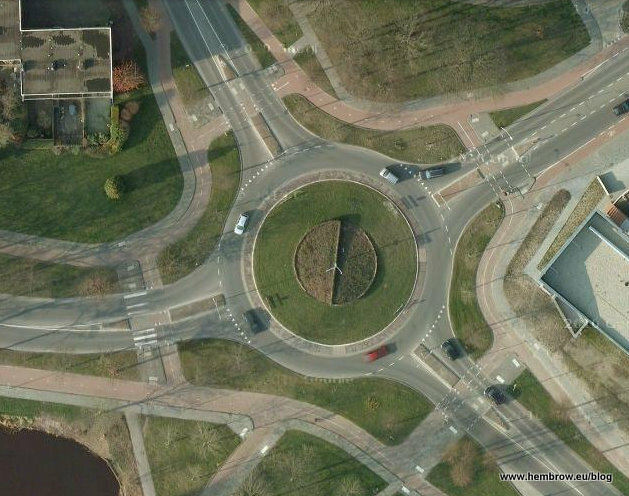 Here is a typical "bicycle friendly" roundabout in the United States. Notice how the bike lane transitions onto a widened sidewalk. Notice the High School on the 1/2 * 1/2 mile property to the Northeast. What a lot of excess land devoted to grass, which in near-desert Colorado isn't the wisest of ideas. I love that to bike past a highway you go under it instead of waiting for a gap in motor traffic to cross it. 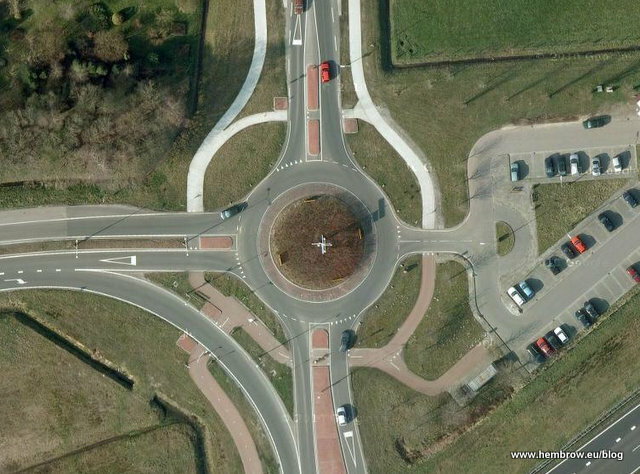 These types of things could also be applied to other highway interchanges other than roundabouts. Even just where a highway is raised they could just make it a little higher to put a tunnel underneath. The nice wide, open ended tunnels you've shown before are great to avoid any worry of social safety. In Richmond, BC, Canada there's a main highway that crosses through it with really no way to get across it by bike except to go way out of your way to underpasses. Something like this would work well at the interchanges. All they would need to do is make the ramps start earlier and put a tunnel underneath. 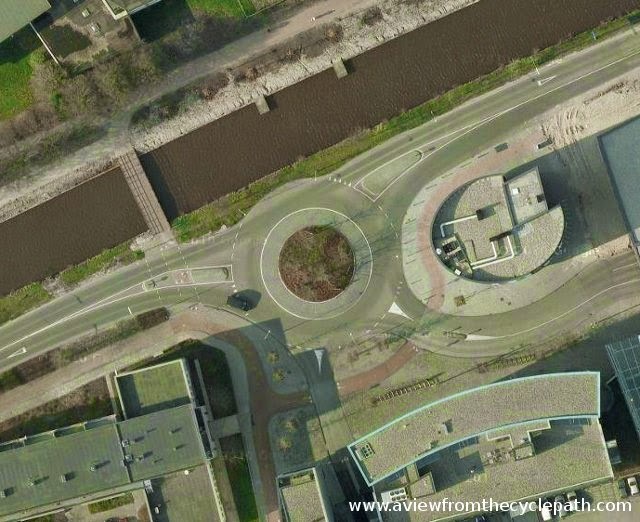 Anyone else notice that roundabout #9 looks like a smiley face? Brightened my day no end. 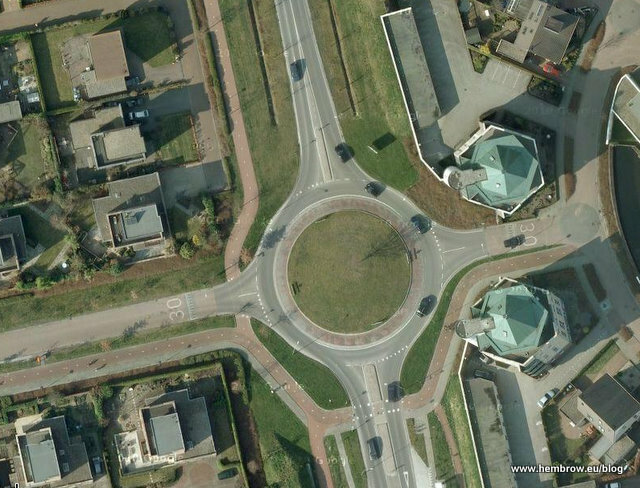 And yep there are alot roundabouts here :) though it does work really well! At the moment they are still creating another one, which isn't on google maps yet. Great inventory! You're right to distinguish that last "roundabout" from the others; in the US, we call it a "neighborhood traffic circle" to distinguish it from a circular intersection that carries through traffic. My students recently did a study of bicycling facilities at roundabouts in the Netherlands, focusing on the Delft / The Hague region. 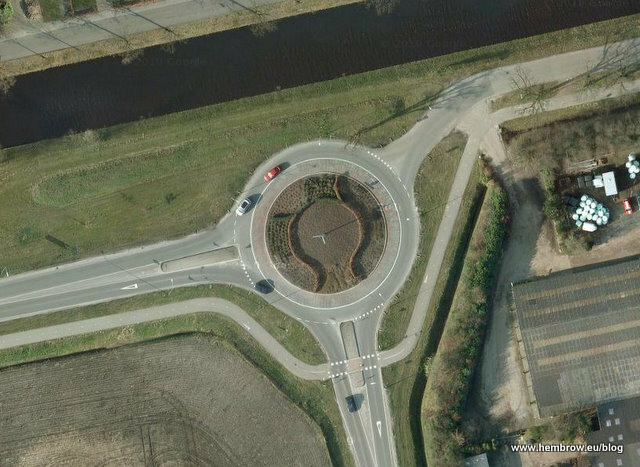 They managed to find one older roundabout without bicycling provisions -- a solution permitted in the CROW Dutch design manual, but not used very often. All the rest had cycle tracks or bike bypass tunnels. We also found a rare case of bike lanes in a roundabout, a practice not recommended by the latest CROW manual, but allowed to remain because it hasn't shown any safety problem. Another student group did a study of the roundabouts in Pijnacker, a suburban community near the Hague, Rotterdam, and Delft. 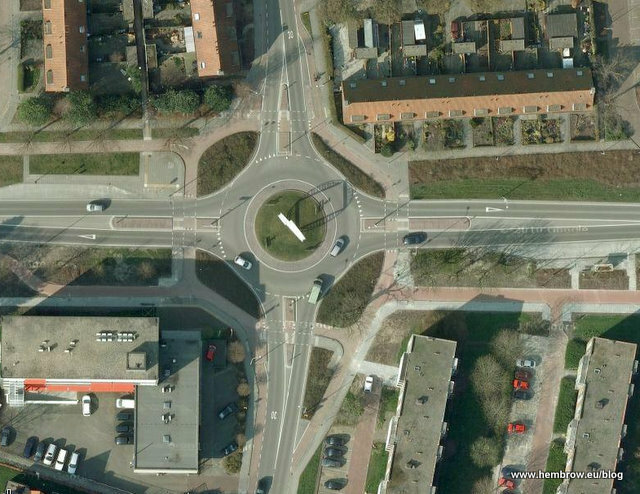 While the study's focus is more on traffic safety, the Pijnacker roundabouts all have bicycle facilities. 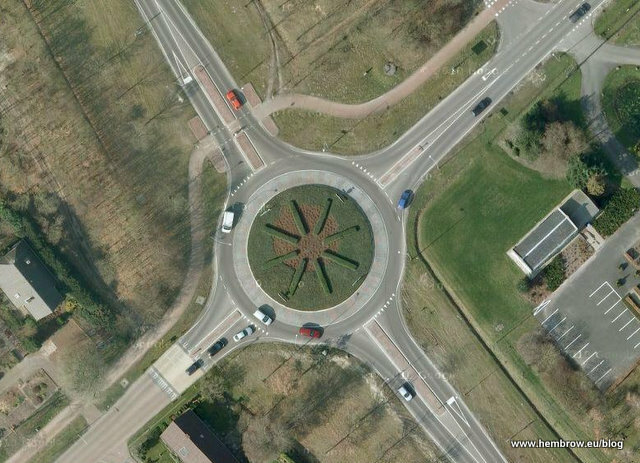 Good examples but are there any examples of very busy roundabouts with built up areas around them? I am talking like two lane 40mph approaches and at least 1500 vehicles going in opposing and heavy left turn traffic from the more minor arms? Would be interested to see if there is something like this in Holland and how it deals with the cyclists getting across. Obviously with roundabouts of this nature being congested the cyclists are going to struggle to find gaps to cross with a motor priority. Also Zebra's would be out due to approach speeds. 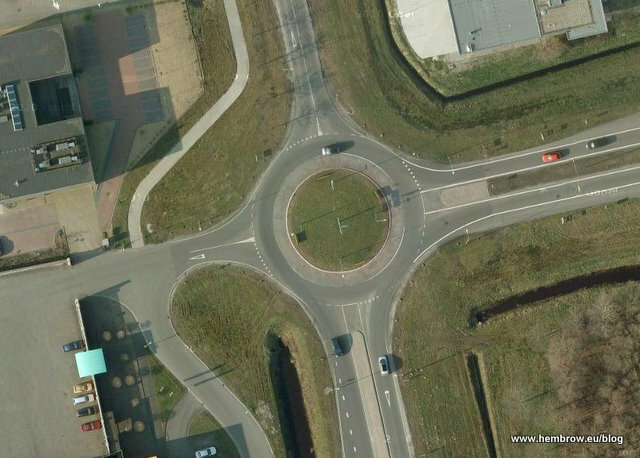 We have a lot of roundabouts like this surrounded by houses and we always find it very difficult to find a way across apart from making people stop at toucan crossings. 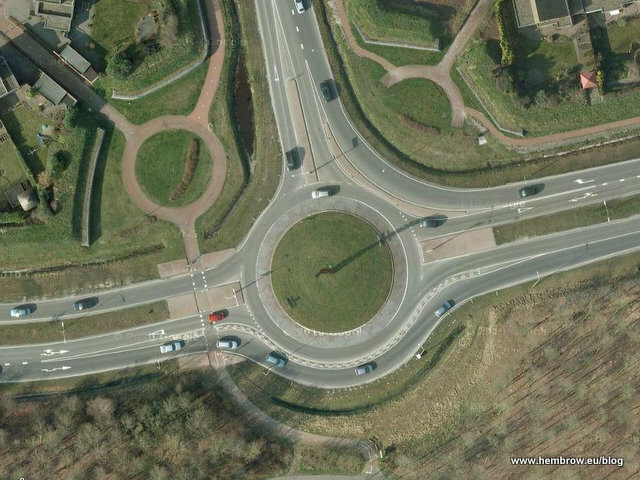 Thedoc: There are no examples at all of the type of roundabout that you ask about anywhere in the Netherlands. These are simply not built. 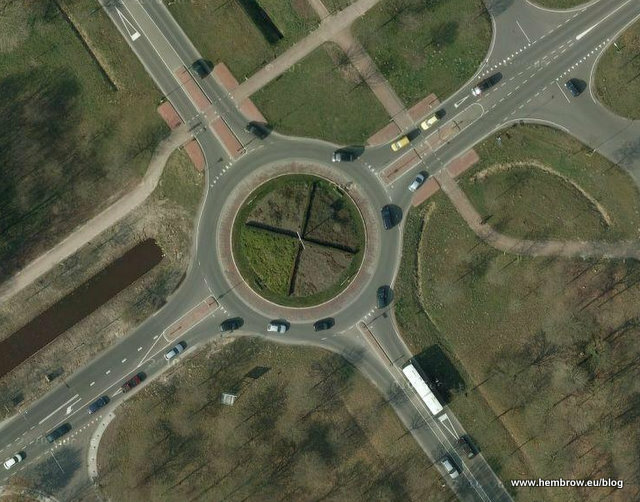 Roundabouts are considered to be suitable up to a relatively small number of vehicles per day, above which the Dutch build traffic light junctions. 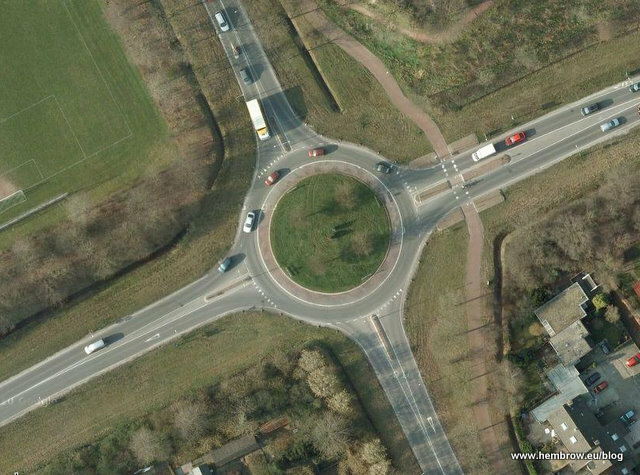 One modern exception is the turbo roundabout, a type of multi-lane roundabout which is intended for more heavy usage by motor vehicles. 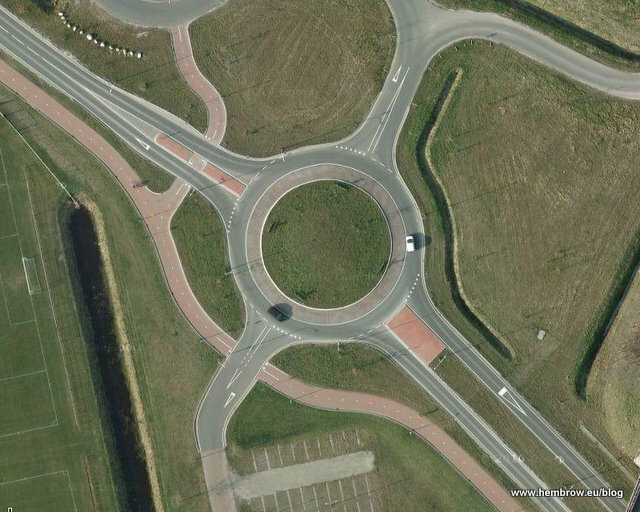 But note that this type of junction is normally constructed in such sites as motorway junctions. 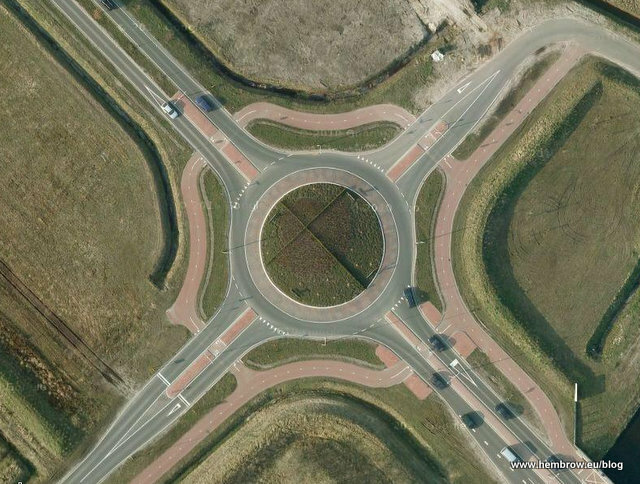 Cyclists should never go anywhere near large junctions like this and certainly not have to cross the road on the level. The correct approach to large roundabouts with high traffic volumes, which cyclists will struggle to cross and where zebras are impossible is to either remove the motor vehicles to create an environment in which a roundabout as above is possible or to give cyclists a grade separated crossing such as the one shown in this video. 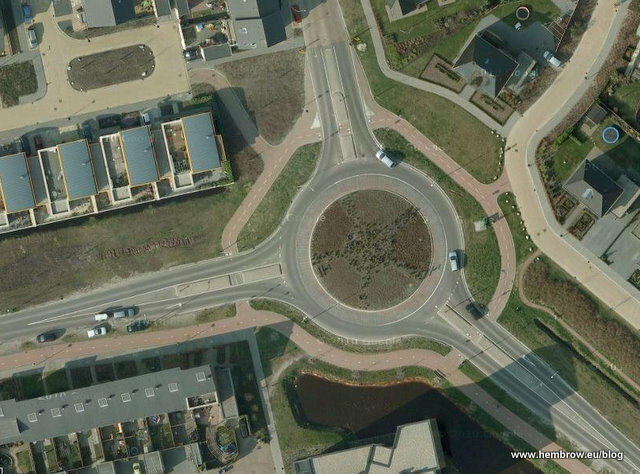 But ask yourself this: Why on earth has the UK built so many huge junctions in the middle of housing areas ? 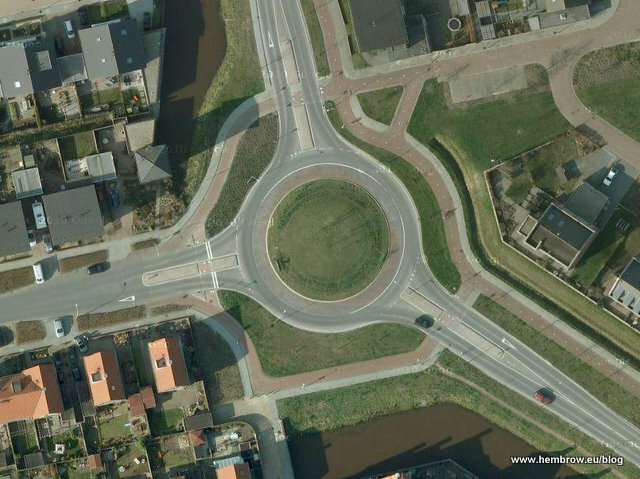 It's a failure of larger scale planning and something that you will very rarely find in the Netherlands. Routes for cycling and driving are unravelled, taking motor vehicles well away from where people live. This not only improves conditions for cyclists but also for residents who don't have to live with noise and traffic fumes. How many cyclists and or pedestrians is too many for a shared use pathway? (Assuming you don't build them like most of the rest of the world as a sidewalk you can ride on and instead build them as bicycle paths you can walk on). Restlesstablet: Almost none is "too many". That's why you always find a separate path for pedestrians anywhere that appreciable pedestrian flows are expected. More here.